In the mid 1990's, Helikites pioneered the use of digital cameras to produce the world's first practical, low cost, Airborne Geo-Information System. Nick Russell of 'Terradat' was the first surveyor to try Helikite photogrammetry to measure the ground, using aircraft measurement software, accurate to 0.4mm. Then the engineering company Bechtel purchased a system to measure railways. It can very accurately survey 10Km of rail track within two hours while the trains run normally underneath. This is a huge cost saving, as traditional survey methods take days and only be done with the trains stopped. In New Zealand, NIWA started using Helikites for power line surveys and Helikites became mainstream airborne GIS platforms, now used by numerous operators worldwide. Automatic flight in all weathers. Steady flying platform reduces camera shake. Suitable for every type and make of cameras. Deployment directly from a vehicle within seconds. No mechanical complexity. Unmatched reliability. Capable of very accurate flight profiles. Minimal legal flight restrictions. 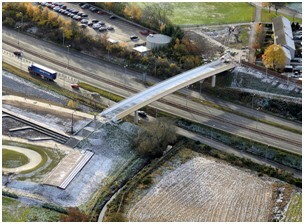 Fly over towns, railways, roads, etc. Easy to organise Helikite operations compared to manned aircraft or UAV's. No technical knowledge required. Anyone can be flying within minutes. No specialised flight training or exams are required to operate Helikites. Far safer than UAV's or manned aircraft. Helikite fly in winds up to 20m/sec compared to 8m/sec for drones. Helikites are about 10 times cheaper to buy and operate than drones. Helikites can be transported worldwide in passenger luggage. Helikite GIS is more reliable than UAV's or drones. Often far more profitable than UAV's, drones, or manned aircraft. Helikites have be used for mapping, archaeology, road surveys, rock-fall monitoring, tailings measurement, river valley erosion, fluvial flow, wave motion, etc. Helikites can produce excellent multispectral NDVI surveys of crop stress, disease and weed infestation for agriculture and horticulture. 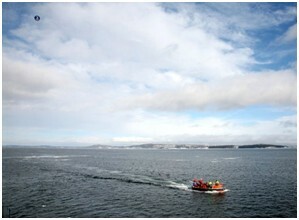 At sea, Helikites are part of the Norwegian airborne emergency oil spill system. 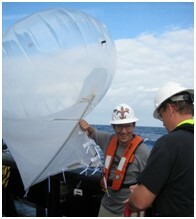 In the USA Helikites measured the extent of the Deepwater Horizon oil slick from boats. Airborne GIS using Helikites is an excellent alternative to using aircraft or UAV's. Mark A. Fonstad et al. 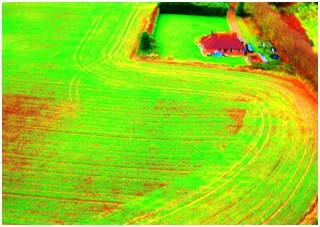 A 1.6m3 Skyshot Helikite is used to enable a ‘structure from motion’ photogrammetric approach (SfM). 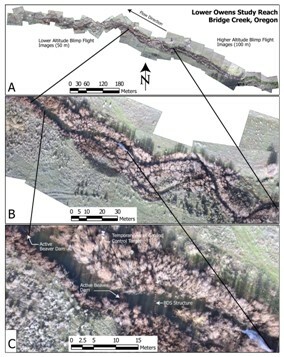 This could deliver a methodological leap if transferred to geomorphic applications. The applicability of SfM is investigated in the Pedernales River, Texas (USA). This test shows that SfM and low-altitude platforms can produce point clouds with point densities comparable with airborne LiDAR, with horizontal and vertical precision in the centimeter range, and with very low capital and labor costs - and low expertise levels. Ghent University Project. 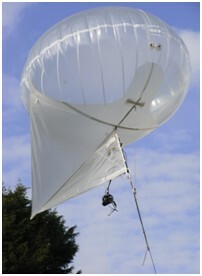 A 7m3 Skyhook Helikite is used to assess the feasibility of taking infra-red film photographs for archaeology in Europe. 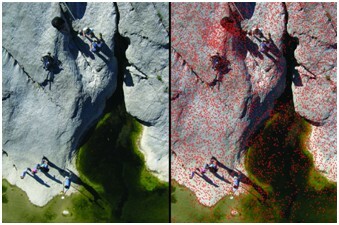 The use of the infra-red spectrum allows features to be observed that are not so noticeable in visible light. 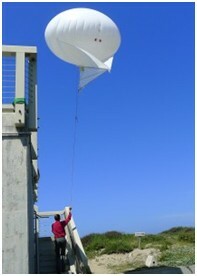 The camera was lifted successfully creating a practical 'Helikite Aerial Photography' system. A 3m3 Skyhook Helikite is used to simultaneously lift a pair of Sony DSC-U30 digital cameras to provide stereo, Near-Infra-Red aerial images. They are used to assess the spatial complexity and condition of a Bermudagrass pasture grazed by horses. 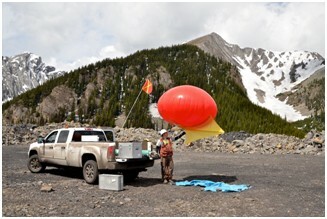 Project by the Utah State University for assessing the use of a 2m2 Skyshot Helikite for fluvial geomorphology surveying and mapping. The work concentrated on Bridge Creek, Oregon. The Helikite was used map the area with aerial photos both before and after a flood to reveal significant features. 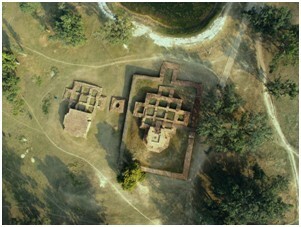 The utility of Helikite aerial photography for rapid, inexpensive aerial mapping is discussed. One third of New Zealand's CO2 emissions come from livestock. 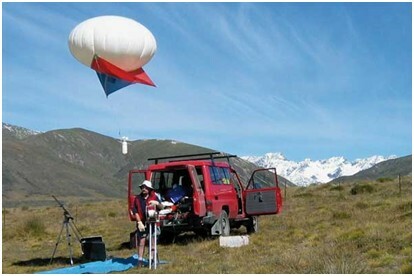 The New Zealand Institute of Water and Atmosphere (NIWA) used a Skyhook Helikite to simultaneously measure methane concentration and also surface layer wind profiles at various altitudes above grazing animals. This data can be used help determine whether this methane may have a significant influence on global warming. Helikites can lift almost every type of camera in the world. The Helikite has a unique 'Universal Camera Mount' capable of steadily holding all designs of cameras and pan/tilt gimbals. Small, handy Helikites can lift cameras with sensors up to 50 Megapixels. Larger Helikites can lift any GIS camera or sensor up to 40Kg. Many cameras have wireless remote controls or internal intervalometers so it is easy for them to take photos when at height. Canon EOS 5DS (50Mp), Nikon D800 (36Mp) Nikon D5200 (24Mp), Sony NEX 7(24 Mp), Ricoh GR2 Digital (12Mp), Pentax Optio W60 (12Mp), GoPro(12Mp) and many others. Small LIDAR's designed for UAV use can be fitted on a Helikite. This is far easier, cheaper and safer than using a UAV. Helikites have the size to lift large magnetometers and can hover over areas humans cannot occupy such as minefields, mashes, water, or other types of dangerous terrain. 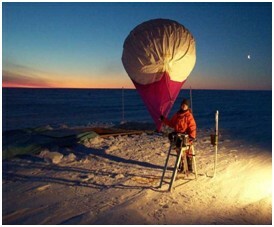 Tethersondes can be lifted on the Helikite or running up the line to produce real-time wind speed profiles, wind direction, humidity etc. 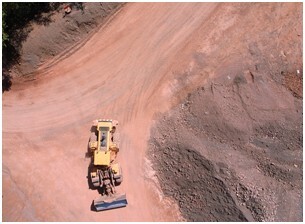 Since the 1990's tremendous advances have been made in camera technology and in GIS software. Now there are umerous excellent mapping, photogrammetery and remote-sensing programs suitable for airborne applications. Ortho-correction, mosaicking and terrain extraction are available from various software developers.